The Fug Girls: What Will Anna Do? A-Dubs would be great as a "counterfeit queen." 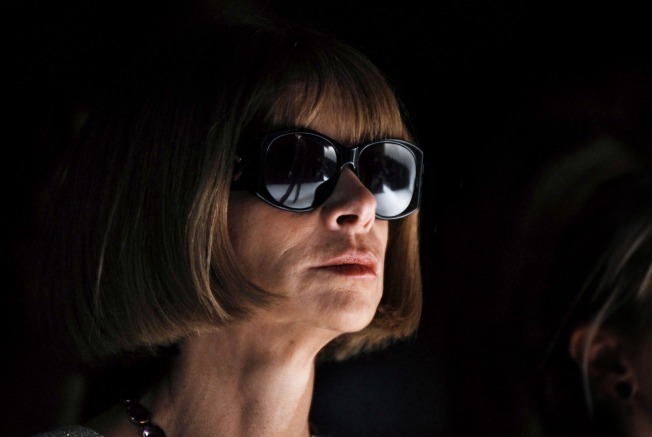 Given our well-documented fondness for Anna Wintour and her mysteriously, persistently unpainted toenails, this unsettling period of retirement rumors -- and whispers of imminent coups by nearly every foreign Vogue editrix -- has set our hardened hearts aflutter. What, exactly, would we do without Lady Bobbington? At Fashion Week, on whose lap would we fear to fall? Under whose gaze would we melt into a puddle of carbs-eating shame? And how the hell else will we ever get into the same room with Roger Federer? Director of Homeland Security. Sure, her lack of experience might prove to be a stumbling block here, but just think about it: Would you want to tangle with A-Dubs? We suspect fear of her wrath is a worldwide phenomenon, thus easily ensuring our national safety. Plus, she and Hillary might have fun shopping for pantsuits together. TV Superstar. Many programs would benefit from a dash of The Bob. For example, she'd make an intriguing third trainer for The Biggest Loser. While Bob and Jillian teach their teams about diet and exercise via hugs and shouting, respectively, Anna would spur her charges to weight loss via chilling silences and disgusted glares. Or she could headline The Apprentice: Wintour Wonderland, which would be like Stylista, except good (and authentic). And there's the obligatory Gossip Girl cameo. It wouldn't surprise us if Chuck Bass were into older, powerful British cougars. Author of Kids' Books. Rumor has it, children are our future, and if the state of the world is any indication, they will need to be fierce at an early age. And heck, if Madonna can write for tots, A-Dubs should be a natural at crafting stories that convey important morals to our next generation of leaders. Imagine the semi-autobiographical truths she could pour into, say, Dubbie the Dragon Goes to Couture Week, Bobby and the Rogue Rice Grain, or the especially moving Why Is Mommy Holding Last Season's Bag? NFL Coach. Anna loves athletes. Anna likely loves taut dudes in tight pants. And Anna probably loves bossing people around; ergo, it's a perfect fit. The soft San Diego Chargers, for one, need a cruel taskmaster who can instill fear along with a killer pass rush; plus, she'd get along swimmingly with star tailback LaDainian Tomlinson -- one of the few, if not the only, players in the league who insists on his helmet having a dark-tinted visor. They're practically soul mates. Counterfeit Queen: No one is more familiar with "It" bags and designer sunglasses than Anna Wintour. So who better to up New York's knockoff game by hanging out on street corners with alarmingly accurate fakes? Her designer friends might not appreciate it, but a girl&rsquo;s got to pay the bills. Bonus: The truck of her Town Car will easily hold most of her inventory. Vitriolic Songstress. Imagine the buzz if Anna released a video of herself prancing around in hot pants while crooning the parody, "Stupid Lady (Put a Ring on It)," dedicated to her nemesis: Roger Federer's girlfriend. Be still our hearts.